Did a search, and here I am! Glad to see we have a local forum! I'm in Sactown and part of the recently re-formed Sacramento Chapter of the VCOA-- you may have seen some of my event posts at the other forums. All are stock with a few cosmetic upgrades. Well, I look forward to getting to know you all and perhaps meeting you in person at a local event sometime soon! BTW, I'd be interested in some of your stickers, if you are still making them! Welcome to the forum! Glad you found us. Nice looking cars you got there! As for stickers, we'll have to wait until Ken shows back up. Big Lan wrote: Welcome to the forum! Glad you found us. Nice looking cars you got there! I'm glad I found you too. Big Lan wrote: As for stickers, we'll have to wait until Ken shows back up. We are slowly gathering the community, and hope to see some more action soon. When the spring comes, I hope to be putting a lot more meets together, and hopefully some regular ones, like the NorCal UFO auto-x events. I'm not sure where to ask this or who to ask, so I thought I would post it here. 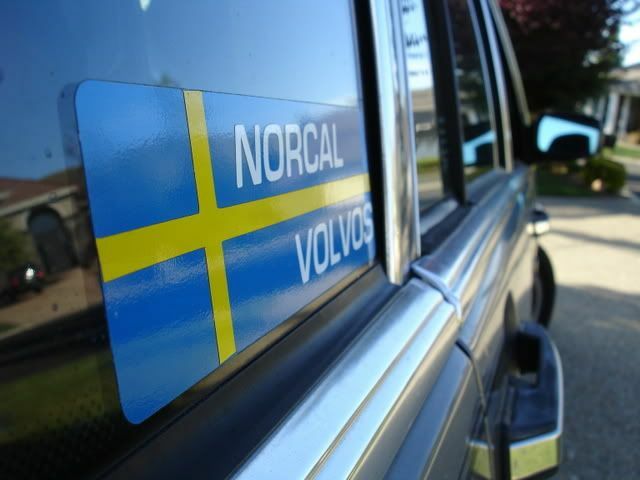 As I mentioned above, I am involved with the Sacramento Chapter of the Volvo Club of America. We are currently working on creating a website (it isn't public yet) and were wondering if you would mind if we provided a link to your site/forum with logo image? Or, do you have another logo/icon you would prefer? I can provide you with the link to our site when it is made public. I look forward to hearing from you (as well as lots of Sactown events in 2009!). where did you get the VOCA badge?? are they for sale somwhere? volvo-slyder wrote: where did you get the VOCA badge?? are they for sale somwhere? LOL, we stole it from Ken anyway! But I'm sure he wouldn't mind. Shoot an email to norcalvolvos@yahoo.com . Be aware also that there's a main site - www.norcalvolvos.com - which this forum is intended to supplement, so be sure to have that link in addition to the one for this forum. Thanks for the extra exposure! Every little bit helps. Thanks for the contact info! I'll send him an e-mail shortly. And, please keep me updated with events so I can add them to the calendar! SwedishBrick242 wrote: Welcome! Glad to see you here! We have somebody at the autox pretty much every month so thats a sure thing. I know a much bigger group is coming to the event in March. Well since you are in Sacramento, you should be aware that there is a car meet once a month on the fourth Sunday of the month in Sacramento put together by EuroSunday. You can visit their website at http://www.eurosunday.net or the Norcal Volvo website at http://www.norcalvolvos.com for the dates of EuroSunday meets and their location. I will for sure be at the Bay Area meet this Sunday 2/15 and the Sacramento meet on Sunday 2/22. Hope to see some of you there. Yeah, it is really great to see some Volvos out there. I may even be pushing some redblock power around the cones this next event... Not certain yet, but it sure would be fun, even if it will probably be slower. VIP_s60 wrote: Well since you are in Sacramento, you should be aware that there is a car meet once a month on the fourth Sunday of the month in Sacramento put together by EuroSunday. You can visit their website at http://www.eurosunday.net or the Norcal Volvo website at http://www.norcalvolvos.com for the dates of EuroSunday meets and their location. I will for sure be at the Bay Area meet this Sunday 2/15 and the Sacramento meet on Sunday 2/22. Hope to see some of you there. We are aware of EuroSunday and are planning attending at least one date as a group/club, but I also need to find a contact person to ask about linking to their site-- Are you a representative of EuroSunday? Hope to meet you all soon at one local event or another! Thanks for the update-- I just got back from sending him a PM over at Turbobricks. And, just to clarify, I am hoping to get permission to list/link the EuroSunday page on our page (i.e., people viewing our site can click on the EuroSunday logo/link to view more info about EuroSunday). It took Davis a few years to build up the numbers it currently has, so it may take Volvo awhile to get a Plus Event at EuroSunday, but every little bit helps, so hopefully we can speed the process up! My mistake, I read your post wrong. I'm pretty sure he won't mind. He wants as much publicity as possible. I don't know if he reads PM at the forums because he just sends out mass posts. If you show up at the Sacramento meet on the 22nd, he'll be there for you to ask in person. He'll be the guy you'll see when you first pull into the parking lot. VIP_s60 wrote: My mistake, I read your post wrong. I'm pretty sure he won't mind. He wants as much publicity as possible. I don't know if he reads PM at the forums because he just sends out mass posts. If you show up at the Sacramento meet on the 22nd, he'll be there for you to ask in person. He'll be the guy you'll see when you first pull into the parking lot. Good stuff! Thanks for the update!